Thank you for the article . It's great to see Her Majesty and Prince Philip enjoying some Jubilee celebrations together, and what a treat for the Bennetts to be able to chat to Her Majesty and exchange well-wishes. I like how he described be as 'warm-hearted'. It must be lovely to know that one is loved by one's subjects . The Queen has arrived in Ireland after being delayed by bad weather, she's wearing pale blue and has had a warm reception. I do hope our own EIIR gets a look at The Queen. The Queen lovely in Wedgewood blue with white for her arrival in Northern Ireland. I love HM's outfit, it's just stunning and it's good to see the DOE looking so much better. The DoE is looking better indeed, how nice to see. The Queen looks amazing in that outfit. I was just watching the visit on the Irish news,some of the crowds were there all night,I hope the weather was kind to them. The Duke is looking more himself; glad to see. ...and the likeness of the Girls of Ireland tiara in lace on her hat. So kind of you to think of me today Lumutqueen, but unfortunately work commitments had to take precedence today. I was simply unable to get anywhere near Enniskillen, or Hillsborough for that matter. I tried to get tickets for the big Jubilee party being held at Stormont tomorrow, but 10,000 tickets were given away on Ticketmaster in just 6 minutes. My mother and I are putting plans in place definitively to go to the Trooping next year when, God willing, we'll see not only HM but the whole family. Today's events seemed a wonderful success, even though the Queen was an hour late due to the uncooperative Northern Irish weather. Big crowds waiting since 4am in the wet and cold. I hope tomorrow's weather is better for the big party. The Queen was today greeted by thousands of well-wishers in the Northern Irish town that witnessed one of the IRAs worst atrocities ahead of a historic meeting with Martin McGuinness. The monarch, who is celebrating her Diamond Jubilee, touched down in Enniskillen this morning before she is expected to travel on to Belfast to shake the hand of the former IRA commander tomorrow in a momentous and controversial step in the Northern Ireland peace process. Her historic visit follows her groundbreaking visit to the Republic of Ireland last year where she made a series of gestures which were seen as a dramatic advance in Anglo-Irish relations – including speaking in Irish at a banquet in her honour. There seemed to be a fairly large crowd out to see HM and HRH today, which is always nice. Is Enniskillen a particularly Unionist area (I hope that is the correct term) or would there be crowds this size everywhere in Northern Ireland? Is that article supposed to say "Another Step to Pace" or is it supposed to be peace? I'm not a Fermanagh woman myself, but I believe that Enniskillen and the county generally are pretty finely balanced in terms of Catholic/Protestant populations. There was quite a mixed crowd there yesterday, probably mostly Protestant but not exclusively so. It's a fluid situation in NI, where the vast majority of Protestants are Unionists, but generally about 20% of Catholics would, if pushed, prefer NI to remain within the Union also. They probably wouldn't identify as Unionist, but would vote in a referendum to maintain the Union. Crowds would certainly be this big anywhere in NI. This is the first time the Queen's visit to NI has been pre-announced in advance. Previously we didn't know the Queen was coming until the day itself, for security reasons, which made it impossible for most people to see her. That's why the crowds were so big this time. 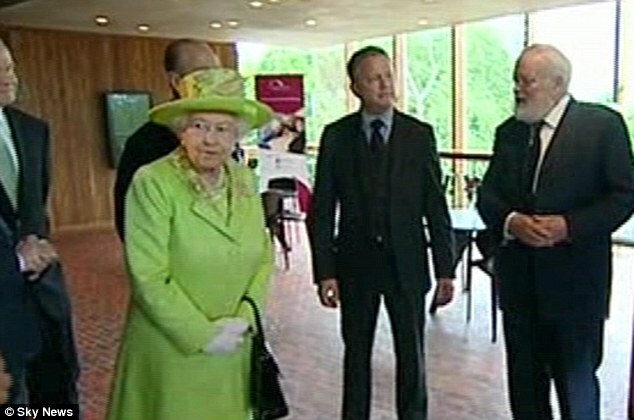 The Queen has worn apple green by Angela Kelly to shake hands with Mr McGuinness this morning, all done and dusted apparently they're now having a nice chat in the Lyric Theatre. We've had a private handshake and will have a public one this afternoon. BBC News - Queen and Martin McGuinness shake hands - There it is: the handshake. HM is even smiling! I doubt she's smiling by choice.